Mitt Romney and Rudy Giuliani. WASHINGTON — Rival factions of Republicans are locked in an increasingly caustic and public battle to influence President-elect Donald Trump’s choice for secretary of state, leaving a prominent hole in an otherwise quickly formed national security team that is unlikely to be filled until next week at the earliest. The debate inside Trump’s wide circle of formal and informal advisers — pitting supporters of one leading contender, Mitt Romney, against those of another, Rudy Giuliani — has led to the kind of dramatic airing of differences that characterized Trump’s unconventional and often squabbling campaign team. And it traces the outlines of the enduring split in the Republican Party between establishment figures who scoffed at Trump’s chances of victory and the grass-roots insurgents who backed him as a disrupter of the Washington power structure. The most publicly vocal faction has been the group opposed to Romney, which has questioned whether he would be loyal after his searing criticism of Trump during the campaign. But Trump himself has told aides that he believes Romney “looks the part” and would make a fine secretary of state, a senior Trump official said Thursday. Trump, who is always difficult to read and is capable of changing his mind at any minute, has also praised Giuliani in recent conversations with acquaintances. Even Thanksgiving did not provide a reprieve from the extraordinary public efforts to cast doubt on Romney. Trump’s campaign manager, Kellyanne Conway, said on Twitter that she had received “a deluge” of concern from people warning against picking Romney, the 2012 Republican presidential nominee and former Massachusetts governor. Those raising concerns about Giuliani, the former New York City mayor and an early and loyal supporter of Trump, have said they fear that his tangle of foreign business ties could lead to a damaging confirmation battle. They are also worried that Giuliani lacks the vigor for the globe-trotting job. 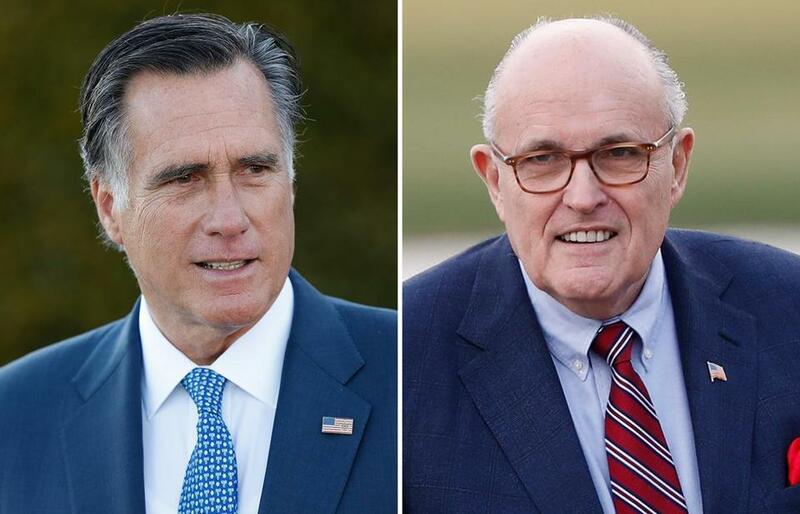 Both Romney and Giuliani have made their interest in the role known to Trump. But while Giuliani has been very public about his intentions — angering Trump at times with his statements — Romney has been more reserved. The split over the two men has opened the door for other candidates. One potential pick Trump and his team have entertained is General John Kelly of the Marines, a former head of the US Southern Command. Others are David H. Petraeus, a retired general and former CIA director, and Tennessee Senator Bob Corker, according to two people involved in the process. Romney would represent a departure from the hard-liners Trump has already picked for his national security team. Aides like Stephen K. Bannon, Trump’s chief strategist, have expressed doubts about how loyal Romney would be given his denunciation of Trump as a “phony” and a “fraud.” Bannon and others have told colleagues they fear that a State Department under Romney could turn into something of a rogue agency. Asked to explain her Twitter post about Romney, Conway said that while she trusted Trump’s judgment, she found it notable that the most outrage directed at Trump from the party’s grass-roots “is not against something he said but something he may do.” In another post, she said that being “loyal” was an important characteristic for a secretary of state. Others hoping to catch Trump’s ear have taken their message to a place they know he is likely to absorb it: cable news. Joe Scarborough, the MSNBC host, who has spoken with Trump about his concerns that Giuliani would not be confirmed by the Senate, has taken to making those arguments on a daily basis on his morning show, which he knows Trump watches. Others, like Newt Gingrich, the former Republican House speaker, and Mike Huckabee, the former governor of Arkansas, have gone on television to try to dissuade Trump from picking Romney. Huckabee, who said during the 2008 presidential campaign that Romney reminded voters of “the guy who laid them off,” told Fox News on Wednesday that picking Romney would be “a real insult” to Trump’s supporters. Giuliani is a favorite of the Republican voters who turned out in large numbers to lift Trump to victory. Sean Hannity, a Fox News host whose opinion Trump often privately solicits, has also been deeply critical of Romney on his show. Shortly after the election, Giuliani told associates that he believed the job was his. He had communicated to Trump’s top advisers that it was the only post he was interested in, according to the people briefed on the discussions. But he began to run afoul of Trump when he told a Wall Street Journal forum that he would probably be a better candidate than John Bolton, who served as one of George W. Bush’s ambassadors to the United Nations. And when reports surfaced about Giuliani’s foreign business entanglements and highly compensated speechmaking, Trump grew even warier. His firm, Giuliani Partners, has had contracts with the government of Qatar, and Giuliani has given paid speeches to a shadowy Iranian opposition group that until 2012 was on the State Department’s list of foreign terrorist organizations. As a backup plan, some of Trump’s aides encouraged him to meet with Romney. Although some in Trump’s inner circle, like Reince Priebus, his choice for chief of staff, thought that such a meeting would anger the president-elect’s supporters, Trump went ahead, and he started sounding Giuliani out about a different post, director of national intelligence. But what many people believed would be a perfunctory meeting with Romney last weekend at Trump’s golf club in Bedminster, N.J., turned into something more substantial. Trump liked Romney quite a bit and was intrigued by the possibility of such a camera-ready option to represent the country around the globe, Trump advisers say. The following day, Giuliani met with Trump and urged him to make a decision in one direction or the other. The option of a third person like Kelly has gained currency in recent days inside the transition team. Kelly served as the senior military assistant to former defense secretary Leon E. Panetta. The Southern Command he led for four years under Obama is responsible for all US military activities in South and Central America.